The last documented sighting of an Eskimo curlew was in Texas in 1962. The Eskimo curlew was a medium sized shorebird measuring 12 inches long. It had a slightly downcurved bill and was a dark, rich cinnamon color. It had a dark crown and vague pale crownstripe. There were v-shaped black markings and barring on the chest and flanks, and its legs were blue-grey. Their primary feathers were solid rather than barred. Eskimo curlew made nests by creating shallow depressions on bare ground in dry tundra areas of the Arctic and subarctic. Females laid 4 eggs per clutch, one clutch per year. Eggs hatched in late June and early July. It is thought that both parents incubated and reared the young. Eskimo curlew chicks were precocial, capable of leaving the nest shortly after hatching. They fed in open natural grassland and tundra, burned prairies, meadows, and pastures. They ate insect eggs found on the prairie grasslands of North America during their northward migration. It is thought that they may have specialized in eating the now-extinct Rocky Mountain grasshopper egg cases and emerging nymphs. Prior to beginning their southern migration, they would stage in Labrador where they ate berries, insects, and crustaceans. The Eskimo curlew migrated incredible distances each year. In the spring, they migrated from South America through the central US and the prairie provinces of Canada to their nesting areas in the Alaskan and Canadian arctic. This northward migration likely began in late February or March with arrival on the breeding grounds in late May. In August they left the breeding grounds and travelled eastward to Labrador and Newfoundland to feed prior to beginning their non-stop southern migration. In the fall, they migrated down the east coast of North America to their wintering grounds in the grasslands of southern South America from southern Brazil and Uruguay to Argentina. The Eskimo curlew nested in arctic tundra areas in Alaska and northwestern Canada and fed in grassland, tundra, burned prairie, meadow, and pasture habitats. They spent the winter in grasslands in the South American countries of Brazil, Uruguay, and Argentina then migrated through North America to their summer breeding grounds in Alaska and northwestern Canada. The current population of Eskimo curlew is estimated at less than 50 individuals. It is highly possible that the species is extinct. It is listed as endangered under the Endangered Species Act (ESA). To learn more, visit the ADF&G Special Status page for Eskimo curlew. 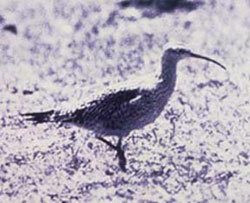 The last documented sighting of the Eskimo curlew was in Texas in 1962. The last individual harvested was in 1963 in Barbados. There were confirmed sightings of a flock of 23 individuals in Texas in 1981 and a single bird in Nebraska in 1987. People reported sightings of the Eskimo curlew in ANWR in 1983, in Argentina in 1990, and in Manitoba, Canada in 1996, but none of these reports were confirmed. The Eskimo curlew was once very abundant with historical population estimates ranging from hundreds of thousands to millions. Unrestricted hunting for the market decimated Eskimo curlew populations leading to a dramatic decline between 1870 and 1890. There was no population recovery following the end of commercial harvest of the Eskimo curlew. Habitat loss and extinction of one of their main prey species may also have contributed to the decline or prevented recovery of the species. If the species is still in existence, the main threat to the Eskimo curlew is habitat loss. The prairie habitat in central North America has been changed due to fire suppression and conversion to agricultural lands. In 1994, only 4% of the prairie habitat on their northern migration route remained. Though its former breeding grounds are relatively undisturbed, they have been taken over by the Whimbrel, a larger shorebird, limiting the available breeding habitat. The grasslands in its former wintering grounds in South America have largely been converted to tree plantations. Eskimo curlews did not stop on their flight south to their wintering grounds in South America. The Rocky Mountain grasshopper, an important prey species for the Eskimo curlew, went extinct in the late 1900s due to the invention of pesticides for use in agriculture. The Eskimo curlew had over 40 common names throughout its range. The few Eskimo curlew individuals that survived the harvest in the late 1800s were sometimes seen migrating with other bird species such as the golden plover and the Whimbrel. The Eskimo curlew was widely hunted for market. 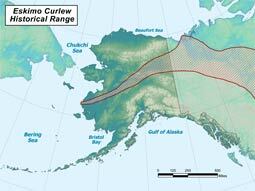 Eskimo curlew meat was all dark and prized for its flavor. Demand was not high before 1880, but as the passenger pigeon population declined, hunters began to look for a replacement and turned to the easily harvested and flavorful Eskimo curlew. Current research conducted by the US Fish and Wildlife Service and US Geological Survey focuses on monitoring historic migration corridors, breeding grounds, and wintering areas in an attempt to document any remaining Eskimo curlew.